The first thing you should know about the “Cincy Three-Way Porter” is that it doesn’t actually have chili in it, Cincinnati-style or otherwise. It’s just inspired by the flavors and aromas of our (in)famous local delicacy. The second thing you should know is that Blank Slate Brewing Company, located near Lunken Airport, recently teamed up with Colorado-based Oskar Blues Brewery to create this chili-inspired brew. Blank Slate owner Scott LaFollette has collaborated with several local breweries in the past including Quaff Bros of Bellevue, Kentucky and Cincinnati’s Triple Digit, but this was their first with a major national brand. 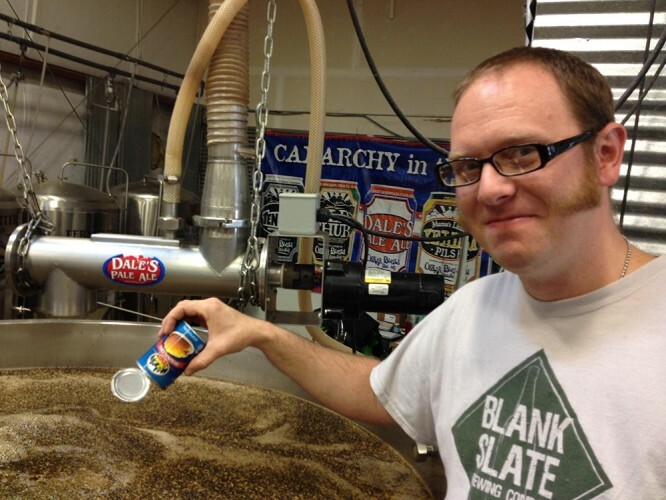 Scott LaFollette (Blank Slate Brewing) working on the beer in Colorado. The beer features some unique additions to a typical porter in order to pair well with Cincinnati-style chili. “The Oskar Blues folks wanted to tie it into Cincinnati in some way,” LaFollette says. Being a recent startup, it’s difficult for LaFollette to step away from his 24/7 operation, but working with a larger brewery afforded him the ability to work on something new while picking up some additional knowledge. “It’s always fun to see how other brewers do things. It’s always a learning experience that you can use to better yourself in your own brewing,” he said. The Cincy Three-Way Porter won’t be available at Blank Slate’s taproom due to state laws forbidding the sale of beer not physically made at a brewery (Scott traveled to Colorado to brew it at Oskar Blues), but the beer will be available in mid-February at several retail locations around Cincinnati (the distribution list is not yet finalized), and also at the Cincy Winter Beerfest on February 13 and 14. Previous articleWhat Diet? Sweet Victory is February 10th!